Take the serene beauty and deep memory of the ocean with you wherever you go. Sea Glass Designs turns the frosted fragments of brilliant sea glass into elegant necklaces, earrings, bracelets and more that reflect the dazzling colors and simplicity of the oceans that produce them. Each piece of handcrafted, authentic sea glass jewelry for sale begins as delicate gems from the beaches of the Abaco Islands. The tropical waters harbor hundreds of forgotten ships, treasures and pieces of history beneath the surface and return them in an elusive rainbow of sculpted sea glass shards. A lifetime in the water softens the edges into stone-like fragments with a vivid, translucent glow. The transformed jewels are then carefully interwoven with sterling silver threads and chains to become beautiful sea glass pendants, rings, bracelets and other signature jewelry designs. Find Sea Glass Designs jewelry for sale in the store, online as well as gift shops, museums and art shows across the U.S. and the Bahamas. Contact Sea Glass Designs today for a custom piece featuring your own design or sea glass pieces. 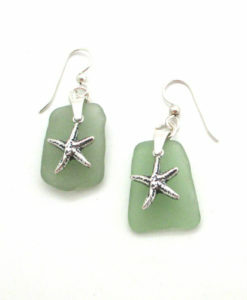 There are few things as beautiful as natural sea glass jewelry. It is a true testament to the power of Mother Nature to take something manmade and potentially dangerous like broken bottles and to turn them into beautiful, smooth, colorful stones. The broken bottles and tableware that eventually make sea glass usually come from shipwrecks. The pieces are tumbled by the tides of the ocean, smoothed by sand and worn until the surface has been frosted. This is a process that cannot be mimicked by human means and the result is very unique, multicolored stones that must be collected on the shoreline of an ocean, river, or bay. 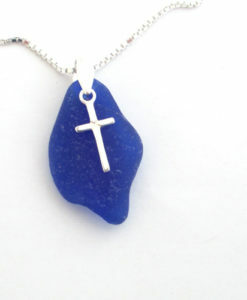 These pieces are becoming harder and harder to find, making sea glass jewelry rarer and rarer! 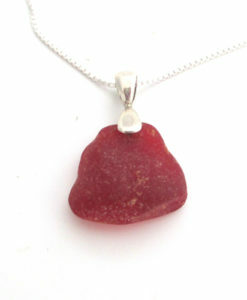 Once it has been collected, it can be used to make a huge variety of unique sea glass jewelry pieces, ranging from sea glass necklaces to bracelets to rings and beyond. Here is our wide variety of sea glass jewelry, where you can be sure to find a piece in a color and style that speaks to you! 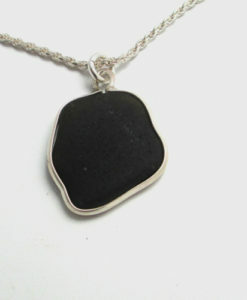 A piece of sea glass makes a beautiful necklace for anyone. 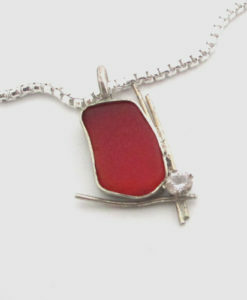 Not only can you find a variety of different designs, you can find a wide range of colors. While green, blue, and white are the most common, we also have red and very dark blue pieces. 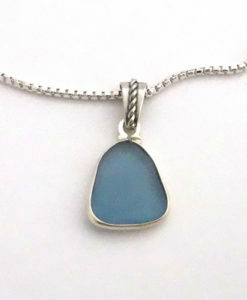 What really makes sea glass necklaces great is that no two pieces are exactly the same. Because you cannot cut or change the shape of the sea glass without risking the frosted exterior, each sea glass necklace is slightly different from every other necklace. No one else will ever own the exact same necklace that you do, neither the color nor the shape. There are a number of different styles to choose from, including our signature collection, where you will find designs that are only offered here on our website. These are accompanied by bezel pieces, were the sea glass has been encased in metal, giving it a very classic appearance. Our Mermaid Teardrop Collection uses many different sizes, colors, and shapes of sea glass to create new and exciting designs, while our simply beautiful line puts the focus of the piece on the color and shape of the glass. The charmed collection comes with beautiful charms that help to express your personal style and the beads and blings line combines sea glass with pearls and precious metals. 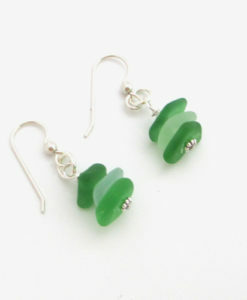 There is perhaps no better way to showcase the uniqueness and staggering color range of sea glass than with sea glass earrings. Whether you prefer long pendant earrings or more demure studs, we have the sea glass earrings for you. From deep, rich, chocolate brown, to clear ocean blue, to the very light aqua, there are many different colors to choose from. If you are trying to match a color to an outfit or choose the best hue for your complexion, we make it easy! These sea glass earrings are mounted with only the best materials and techniques, so they will stand the test of time and continue to look beautiful even decades down the line. Sea glass rings are a great way to complement another piece of sea glass jewelry or to simply bring attention to your hands. We use only the best pieces of sea glass and the highest quality metal to make our rings. They are perfect for everyday wear or for special occasions. If you know someone who loves the ocean, a sea glass ring might be the perfect way to help them display their love of the water. Each piece is mounted to show off the texture and color of the sea glass, allowing light to play on the frosted surface. 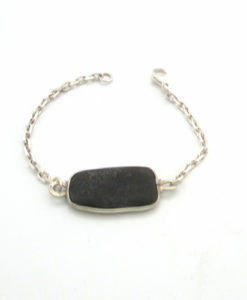 Sea glass bracelets are another great option for complementing a sea glass necklace or a pair of sea glass earrings. 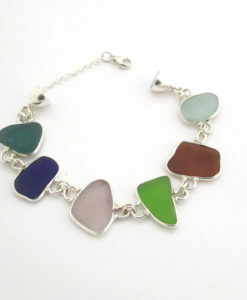 Whether you want a single piece of sea glass displayed on your wrist or you want the full spectrum of sea glass color, we have a bracelet in our collection for you. From the very simple and classic, to the very bohemian, we have taken special care to choose only the best pieces of sea glass and craft them into stunning bracelets. Set in silver, these pieces of sea glass look like slices of gem stones. 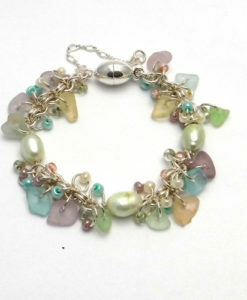 The bezel settings used in many of our sea glass bracelets highlights the color in each of the pieces of sea glass, while other designs combine the glass with beads and pearls to help highlight the unique shape and color of the glass. 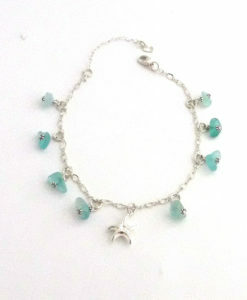 Sea glass anklets are a great way to wear a little color. 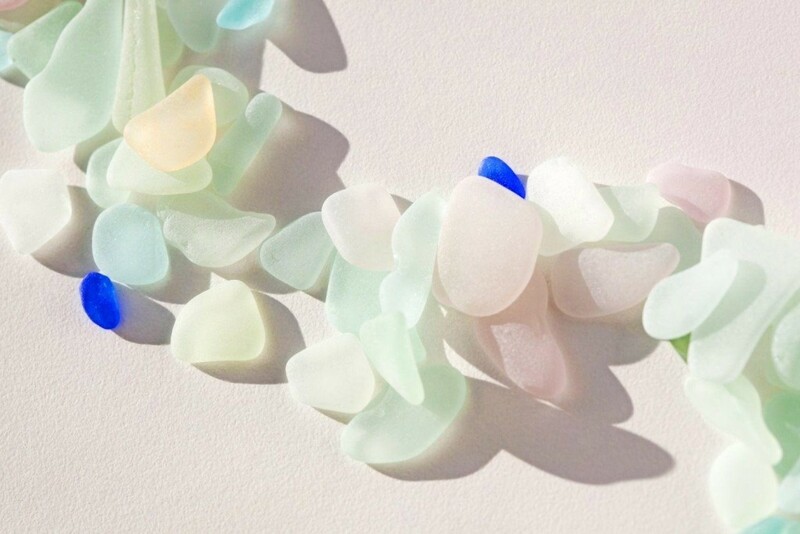 For our sea glass anklets, we have chosen only the deepest, richest, most pigmented pieces of sea glass. 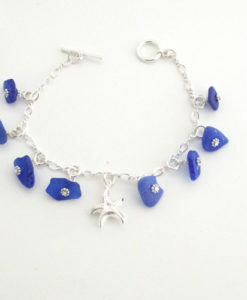 We then choose only the best shapes and use bezel settings to make sure that no matter how often you wear your sea glass anklets, you will never have to worry about losing your beautiful piece of sea glass. Choose from a variety of different chains and designs!